Hartzell Air Movement explains that the program includes numerous axial and centrifugal fans capable of being installed in many different applications such as wastewater, marine, warehouse ventilation, and food processing. Some of the fans in the program can be shipped in as little as 48 hours. Other fans allow the customer to customize a range of motors or accessories. Customers can select rapid ship fans by using Hartzell-FLOW®, Hartzell’s fan selection software. 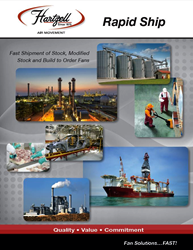 Fans and accessories from the rapid ship program can be ordered by contacting the local Hartzell Air Movement sales rep.
Hartzell Air Movement adds that it is a leading manufacturer of industrial air moving solutions to a variety of markets throughout the world. The company manufactures in Ohio and Indiana and has been in business since 1875.